The innermost layer of a woman’s clothing was a linen or woolen chemise, shift or smock, some fitting the figure and some loosely garmented. There are some mentiongs of a “breast girdle” or “breast band” which may have been the precursor of a modern bra. Women also wore hose or stockings, although women’s hose generally only reached to the knee. Read more here. 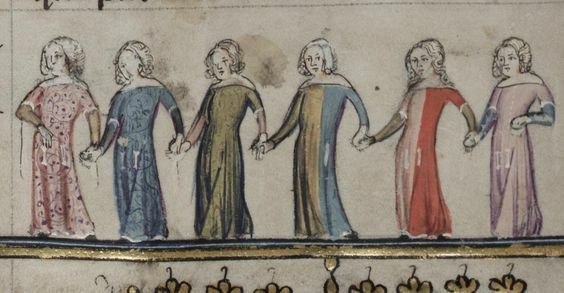 Women in a shift c. 1376. Here I notice that it is two parts with a waistline just under the breast. Chemise, 1378 Note center core and inside and outside sleeve seams. Women wore long cote/cotta/tunic/kirtle (kjortel), the length depended on their station and wealth. The cote would be worn over the shift and often under an outer layer often a surcote. While the cote of the early medieval period was a loose garment, it became fitted around mid 1300’s as the outer layers grew more fitted as well. It was usually to the ancles, but could be substancally longer for formal occations (or when the artist didn’t want to draw feet it would seem). Fitted kirtles had full skirts made by adding triangular gores to widen the hem without adding bulk at the waist. The sleeves seem to have been either fitted all the way or fitted from the albow down the wrist, sometimes reaching to the knuckes. Maid and lady both in simple loose cotes with tight sleeves. The lady is having her hair braided and pined by her maid, who is wearing a veil. c. 1325-1335. 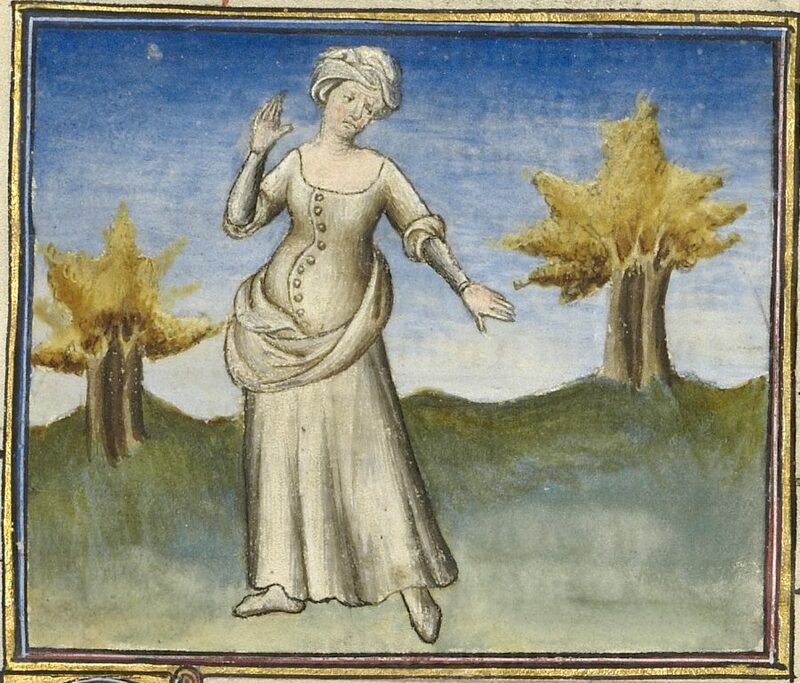 Woman gathering eggs in a very simple gown with a low neckline. It might just be her kirtle/cote. Thoughout the 1300’s the surecote comes in a number of different edirations. From a simple large tunic and cyclas to the complicated pelice over the houppelande and sometimes a robe. For a long time noble women would wear surcotes with large armholes showing off the tunic underneath that would be of a different fabric. A cyclas began as a rectangular piece of cloth with a hole in it for the head. Over time the sides were sewn together to make a long, sleeveless tunic. In the first half of the century the cyclas is open from the shoulder to the waistline in a straight line. On a few examples it is however much shorter – just allowing the arm though or opening a bit smaller. On a few examples the arm hole is rounded so that it shows off more of the cote under the cyclas. This style will become more destint ending up with the fur trimmed and turning into a pellote/pelice or surcote ouverte. The cotehardie was a 1300-1500’s unisex garment tailored to fit the torso and arms, usually with a row of buttons down the front as well as down each fitted sleeve from the elbow to the wrist. Women’s coathardies trailed on the floor.It was mostly worn in 1300’s and early 1400’s – at least without anything over it. Cote hardie literally “daring cote.” Women’s versions were tight-fitting outer garments. The buttons also added decoration to the gown. The buttons also allowed the sleeve to be tightly fitted. The neckline dropped and got wider. The sleeves of the cotehardie got ornamented and the sleeve wider or streamers, also known as tippets was added. 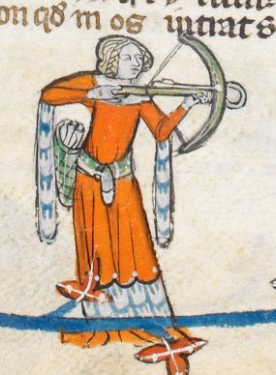 Hunting woman with a crossbow wearing a red cote and red surcote with hanging sleeves. 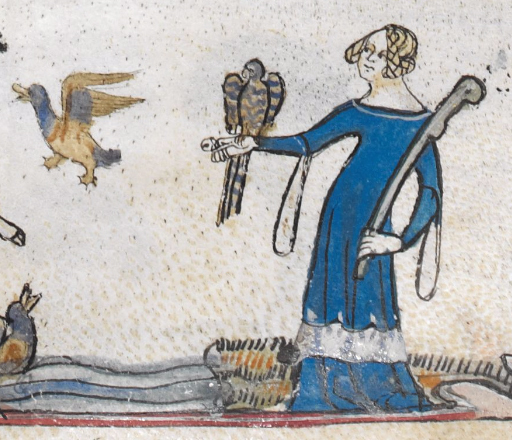 Hunting woman with a crossbow wearing a red cote and rose surcote with hanging sleeves. Cote hardie literally “daring cote.” Worn in 1300’s and early 1400’s. Women’s versions were tight-fitting outer garments. Over time the cyclas developed into the Sideless surcote or pellote/pelice, plackard or surcote ouverte and were popular from the mid 1300’s until the 1500’s as a symbol of rank among the noble women. The sideless surcote was a woman’s sleeveless outer garment, with very large armholes trimmed with fur. They are sometimes known as “hells gates” – presumably because they show of the shape of the woman under the surcote. Over time the bliaut develope into the houppelande/pallanda, which is introduced in the 1360’s. It is a sleeved, front-closing robe worn by both sexes. It is always full-length on women; sometimes short on men. In the north they are called pallanda. Full-bodied houppelandes with voluminous sleeves worn with elaborate headdresses are characteristic of the earlier 1400’s. 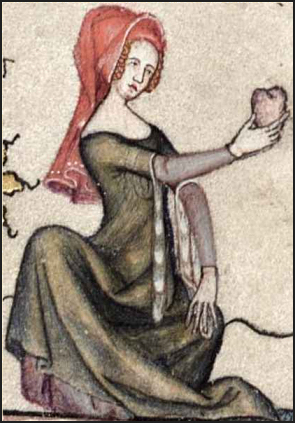 In the late 1300’s women would wear a robe (kåbe) belted just under the breasts. The robe would have a lot of fabric, folds and huge sleeves. 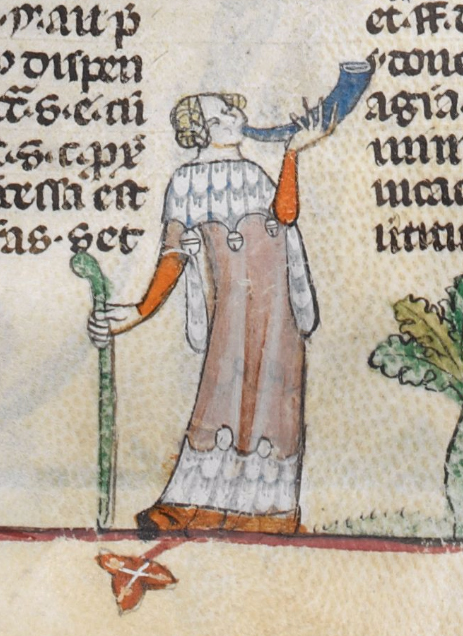 Mary de Bohun in a high collared robe with wide sleeves and small wrist openings. It is belted just under her breasts. She also has funky hair.